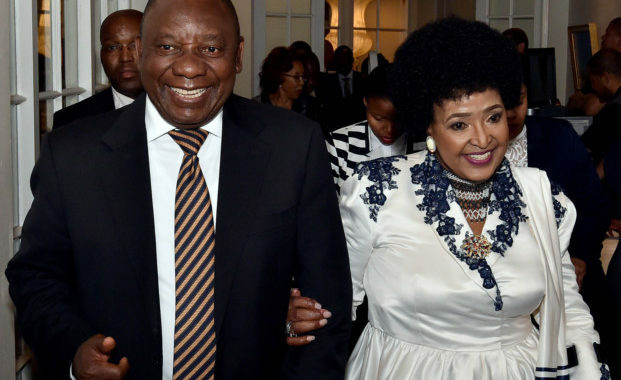 Mama Winnie was a diamond, built to shine, never to break – President Ramaphosa - SABC News - Breaking news, special reports, world, business, sport coverage of all South African current events. Africa's news leader. Mama Winnie Madikizela-Mandela has been a constant companion throughout our lives and throughout our struggle. When, like Madiba, she was banished from our presence, she was present in our consciousness and in our hearts. Mama Winnie lived a rich and eventful life, whose victories and setbacks traced the progress of the struggle of our people for freedom. It was a life marked by service, sacrifice, determination – a life that taught us much about the tenacity of the human spirit. The life of Mama Winnie gives full expression to our rallying cry: Wathint’ Abafazi, Wathint’ Imbokodo. But she was not just any rock. She was a diamond, built to shine, built to last, built never to break. Like a diamond, she conveyed complexity, strength and beauty. Harassed, hounded and tortured by a brutal and murderous state, she would not shatter. Stripped of the comfort of family life, banned and imprisoned, she stood firm. Separated from her husband by steel bars and the cold waters of Table Bay, she had to be both mother and father to her children and to the nation. She remained a symbol of strength for the many women who had lost their partners and children to the liberation struggle. She was a symbol of defiance for the many women who were themselves freedom fighters and who had to endure not only the racism of the apartheid state, but the sexism of a patriarchal system. Regardless of her own pain, she ensured that the children and families of liberation were clothed and fed. She gave them hope and encouragement. She fought to ensure that Madiba would never be forgotten, that his name would remain in the hearts and minds of the oppressed people of the world. Today, with the benefit of hindsight, we must acknowledge that her strength and generosity of spirit placed upon her an inordinate burden. Often having to endure in solitude, for our sake she masked her pain, held back her cries and hid the bruises of her suffering. We know that she did not join the struggle with the expectation of recognition or reward, but by the sheer weight of her contribution, her name will forever secure a permanent place in the history of our liberation struggle. From her life, future generations will understand what it means to be a freedom fighter of determination and sacrifice. From her life, they will know what it means to stand for justice. From her life, they will know what it means to be faithful and loyal to the cause of human freedom. From her life, they will know that women can, do and have shaped the course of our history. From her life, they will learn what it truly means to be revolutionary. They will learn that there is nothing revolutionary about howling insults and using the privilege of elected office to ridicule and demean others. There is nothing revolutionary about seeking the votes of the people for self-enrichment and aggrandisement. When future generations ask about her, we will tell them to read Maya Angelou’s poem, “And still I rise”, for it could easily have been written to describe her life. Like so many of our people she lived with fear, pain, loss and disappointment. And yet each day she rose with the nobleness of the human spirit. They sought to denigrate her with bitter and twisted lies, but still she rose. They wanted to see her broken, with bowed head and lowered eyes, and weakened by soulful cries, but still she rose. They tried to defeat her with their hatefulness, but, like the masses who called her mother, still she rose. Out of the huts of history’s shame, she rose. Up from a past rooted in pain, she rose. And as we celebrated in a free and democratic nation, still she rose, and carried with her the dreams and hopes of the slave.